This is a final reminder that today is the deadline to enter the 11th annual Web Marketing Association's Internet Advertising Competition Awards. All forms of online advertising are included. Entering is easy, but if you don't enter, no one will know how really great your work really is! To enter, go to http://www.iacaward.org/iac/nominator_default.asp and log in to your Nominator Account or create a new one. Fill out the entry form and your in. Get it done today or be sure to go home empty handed when the award winners are announced! Congrats to Madeline Goldberg of RED Interactive Agency. She won a full conference pass to the Online Marketing Summit in San Diego, February 11-13! It will be three days of 70+ conference sessions and workshops across eight tracks and discover the latest insights on analytics & big data, content marketing, demand generation, email, mobile, search, social, and strategy. There is still time to register to attend. Go to http://www.onlinemarketingsummit.com/sandiego/ for complete information. There are only two more weeks to enter the Web Marketing’s 11th annual Internet Advertising Competition Awards. 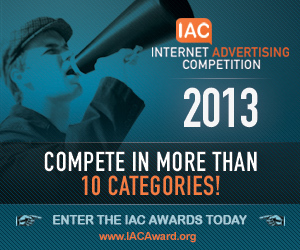 The IAC Awards are the oldest industry-based advertising award competition dedicated exclusively to online advertising. The Competition Web site is located at www.iacaward.org and the deadline for entry is January 31, 2013. Banner ads, Online newsletters, Email Campaigns, Websites, Social Media, Online Video, Mobile Apps and Integrated ad campaigns. Don’t wait until the last minute! Enter today! This month we are giving-a-way a full conference pass to the Online Marketing summit in San Diego, February 11-13. It will be three days of 70+ conference sessions and workshops across eight tracks and discover the latest insights on analytics & big data, content marketing, demand generation, email, mobile, search, social, and strategy. To enter, send an email to WMA@webaward.org with your name, job title, company and mailing address. We’ll select one lucky winner on January 18th. Entering is easy. Simply create a Nominator Account or log in to an existing Nominator Account. Upload your creative and pick you industry and format. We’ll send our judges to evaluate it based on creativity, innovation, impact, design, copywriting, and use of the medium. If you have the highest average score in your industry, you’re a winner!